A MUST-HAVE FOR EVERY SCHOOL! 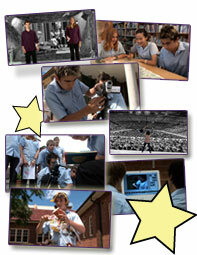 MAKING FANTASTIC SHORT FILMS has proven to be an invaluable resource for Australian and New Zealand schools. Teachers currently using it are raving about its value. Our aim is to get MFSF into every school possible. If your school is outside Australia, New Zealand, and the USA, you are still welcome to purchase your copy of MFSF through our Australian warehouse. Please note that MFSF is currently available only in the PAL video format. This resource should play on any computer system in the world, but will not play on NTSC televisions or in NTSC DVD players. The NTSC version is coming soon. The foreign language versions of MFSF will include all teacher guides, student handouts, titles, graphics and artwork in your own native language. Plus, the DVD will be dubbed into your native language, and will included both English and your native language subtitles, making it an even more valuable resource. Filmmaking is the artwork of the future, and MAKING FANTASTIC SHORT FILMS is designed to launch the next generation of filmmakers. The foreign language versions are still being developed, and at the moment, we have no release dates set. Pricing is also to be determined, but will be appropriate to your country.